Kim Kardashian‘s wedding photos are in British Hello! 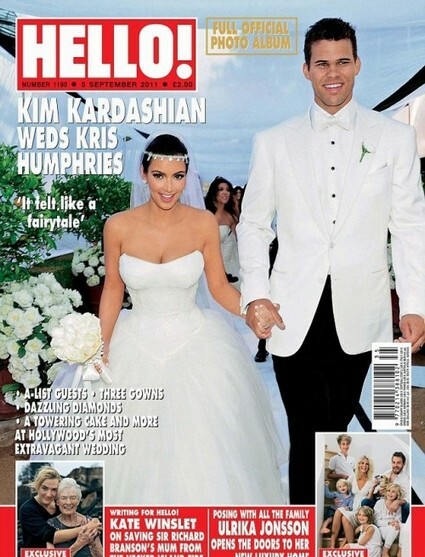 and this time new husband Kris Humphries was allowed to be on the cover. I swear Kris looks like Jethro Bodine from the Beverley Hillbillies, except Jethro was a bit nicer looking. Do you see it?? Kim says the wedding was like a fairy tale, but in my opinion it was like a nightmare in white. Far too much white! Kim and Kris got married in front of 400 guests and friends last weekend. Kim wore a Vera Wang and it looks like the magazine Photoshopped her waist to look thinner. She wore three more Vera Wang dresses during the evening. Kris said about his new bride: “She took my breath away. She was so shockingly beautiful.” I wonder what he is going to be saying in a few months from now? Not only did Kim wear white but the her bridesmaid’s sisters Kourtney and Khloe Kardashian wore white too (see pic below). It is hard to tell who is the bride and who is the bridesmaid. If you just can’t resist pick up the current issue of Hello! which has all the photos and the scoop on Kim’s plan to start a family.